KING OF THE WILD FRONTIER!!! Offered here is an original DAVY CROCKETT and the RIVER PIRATES Movie Poster. THIS IS AN ORIGINAL RKO THEATRICAL MOVIE POSTER measuring approx. This poster is in really nice shape, with typical folds, and some edge wear including small tears and chunking Will be mailed rolled and will look AWESOME in a frame! Davy Crockett and the River Pirates. 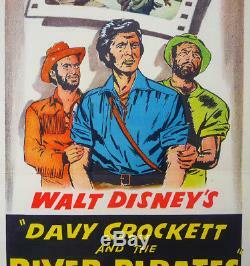 Is a 1956 live action Walt Disney adventure starring Fess Parker as Davy Crockett. It was shot in Cave-In-Rock, Illinois. This film acts as a prequel to 1955's Davy Crockett, King of the Wild Frontier and is an edited compilation of the fourth and fifth stories featuring the Disney Television series Davy Crockett. This was only the ninth live-action film produced by Walt Disney Productions. The item "Original DAVY CROCKETT and the RIVER PIRATES Movie Poster (1956) WALT DISNEY RKO" is in sale since Tuesday, July 17, 2018. This item is in the category "Entertainment Memorabilia\Movie Memorabilia\Posters\Originals-United States\1950-59". The seller is "popbotics" and is located in Los Gatos, California.